“It’s such an ancient pitch. It’s always easy to write about something emotionally resonant, something socially relevant, something that wishes to make a specific point. Regardless of whether these types of series actually succeed, I’ve always found that they leave me with something to say, be it complimentary or not. 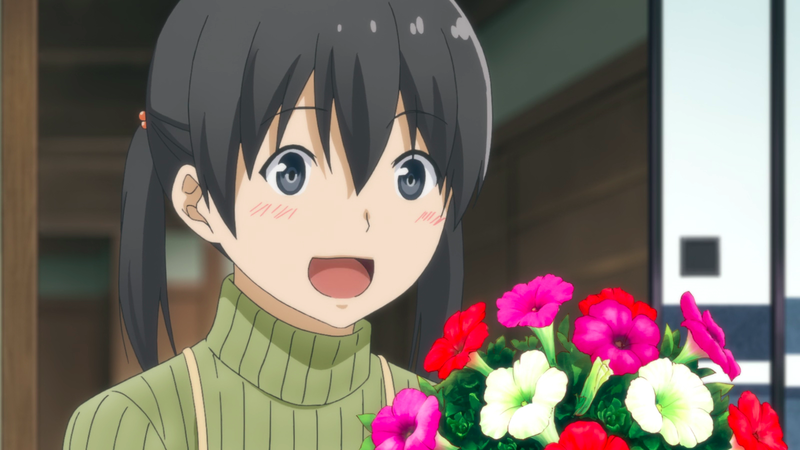 Keeping my own writing inadequacies in mind, I’m going to make an attempt at writing about the most delightful series of this past spring: Flying Witch. 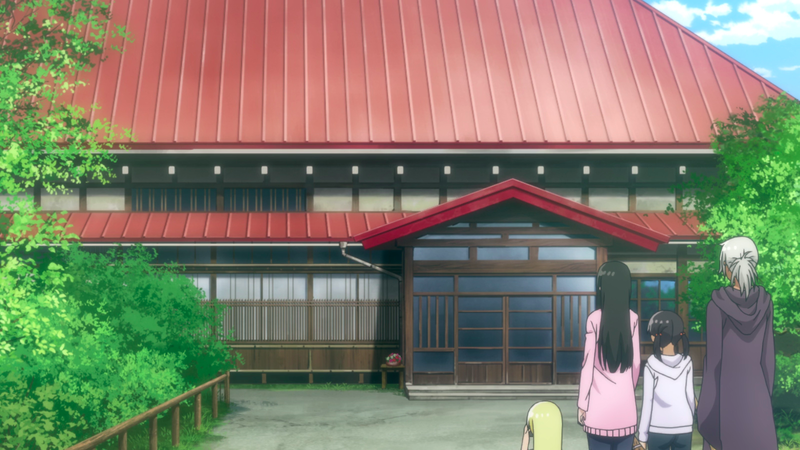 From its first episode, Flying Witch juxtaposes a sleepy mountain village with the mystical perception of witchcraft. We’re told that Makoto Kowata is a witch thanks to the title of the series, but during Makoto’s arrival and introduction of her cousins, Chinatsu and Kei Kuramoto, never expressly say that she’s a witch. 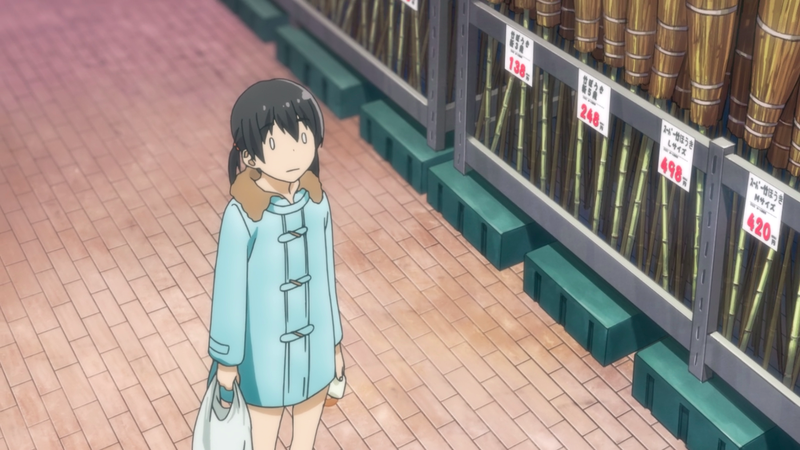 Flying Witch continues to play with its audience throughout the first episode by teasing the knowledge of Makoto’s magical abilities without visually revealing them. 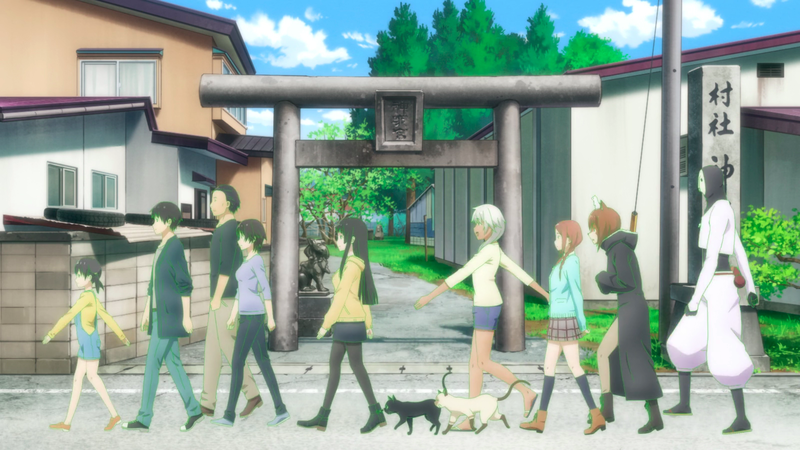 The opening scenes of the series simply covers Makoto and her cousins walking through the village, and Makoto settling into her room. Makoto’s “conversation” with Chito is the only thing out of the ordinary, and even this could be written off as Makoto being overly attached to her pet. 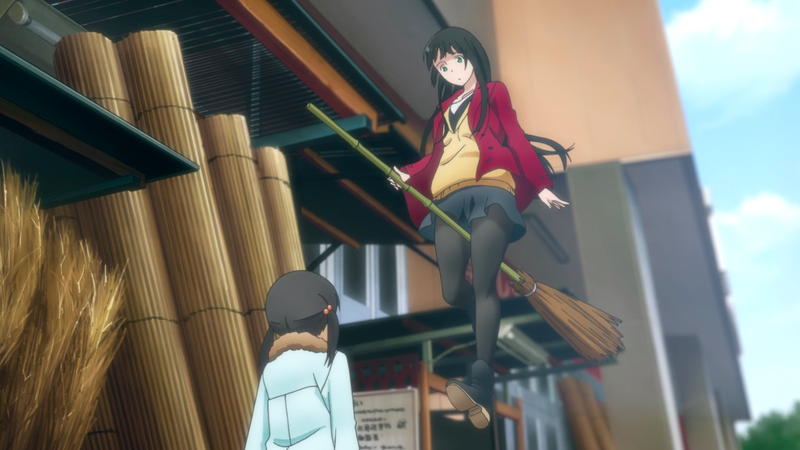 The visual reveal comes in the middle of the episode when Makoto flies on a broom in front of Chinatsu to test it out. 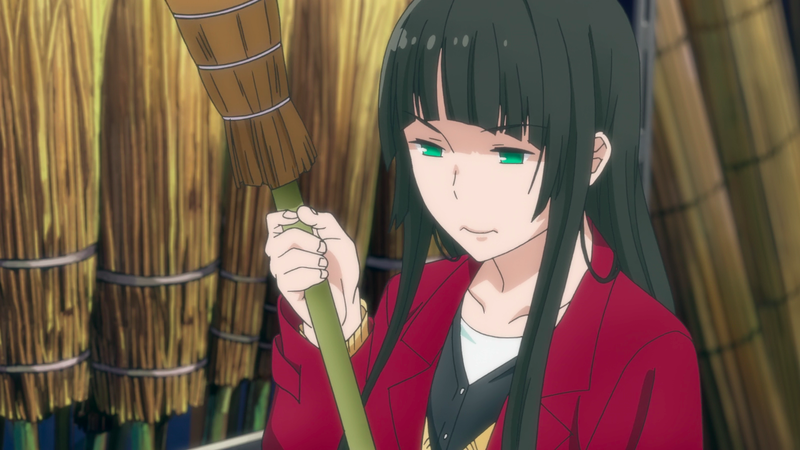 Flying Witch is masterful, unveiling Makoto’s — and later various other characters with magical abilities — witch activities with perfect buildup and framing. There is no big announcement from Makoto of her witchcraft, the series is content to show us rather than explain. 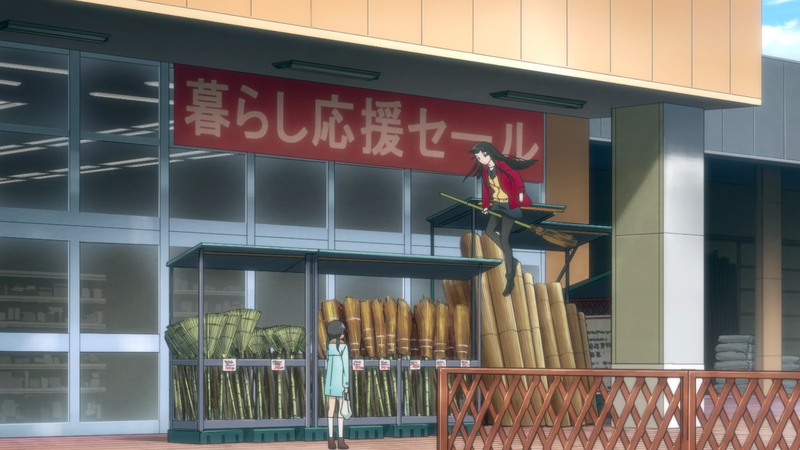 After a wholly mundane shopping trip, Makoto spots brooms for sale outside of the store. As soon as she spots them we presume, as a sage audience that knows Makoto is a witch, that she’ll be using them for flying — that’s what witches do, after all. She eyes the broom before shrugging that it will do, and the series cuts to her feet as she mounts it. 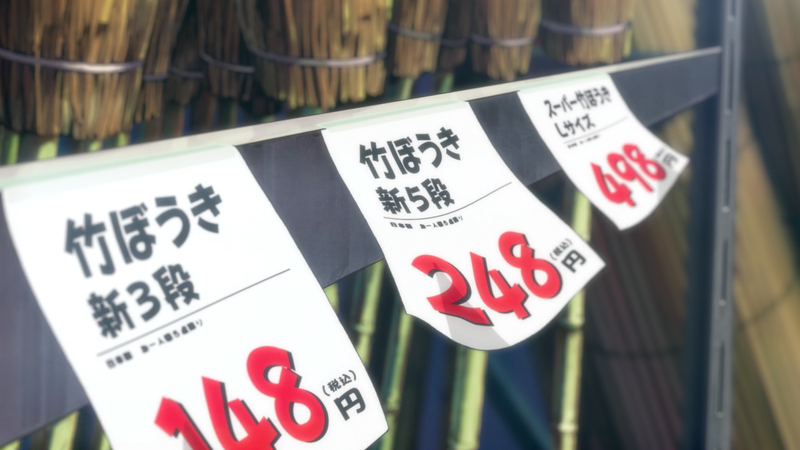 Interspersed between our first glimpse of Makoto flying and her shoes kicking off from the ground are shots of wind blowing through price tags and a leaf that moves through a puddle with the breeze. The background music adds the perfect amount of ambience to the scene making it, for lack of a better word, magical. We also see Chinatsu’s stunned reaction to Makoto’s powers followed by an overall shot of Makoto in front of the store — a perfectly normal scene aside from the high school girl flying on a broom. This mixing of the magical and mundane occurs throughout the series. Episodes focus on the charm or isolation of small-town life, and even Makoto’s or her sister Akane’s spells are simple in execution. The oddest events of the series all surround Akane — a fully-fledged and extremely talented witch — whether they involve doing silly things with friends while drunk, or traveling to exotic locales in order to test her spells. 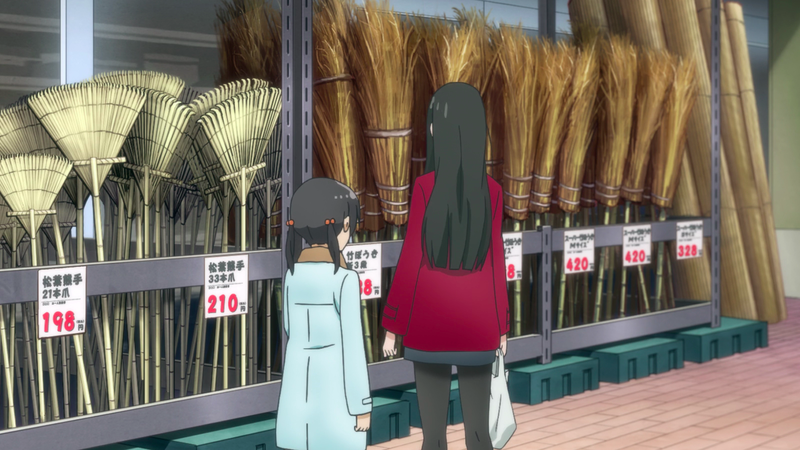 Flying Witch mixes these in with the most average or ordinary scenes of daily life, like watching a pancake rise on a griddle as it cooks, or shopping for fabrics. 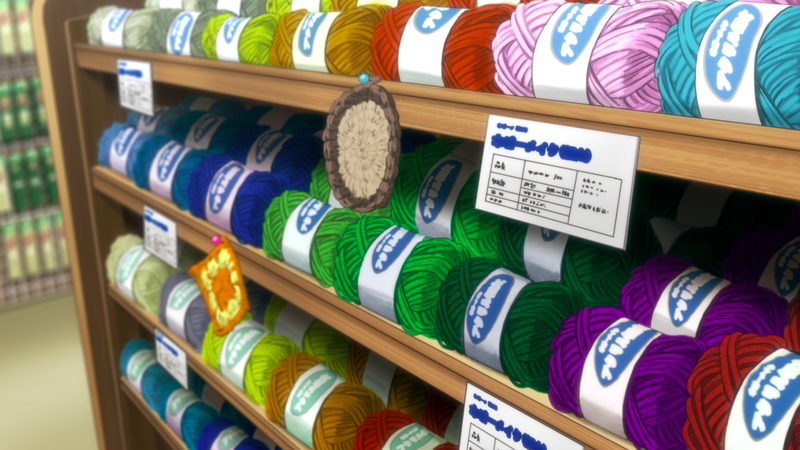 Despite the fact that we know Makoto and other characters in the series are witches, Flying Witch’s dedication to displaying the charm of its setting and simple, daily routines means that we never know when the witchcraft will begin. This has the added bonus of making even the most common events seem magical. The series also uses both pillow and establishing shots for added effect, continuously breathing life into Makoto’s new surroundings. 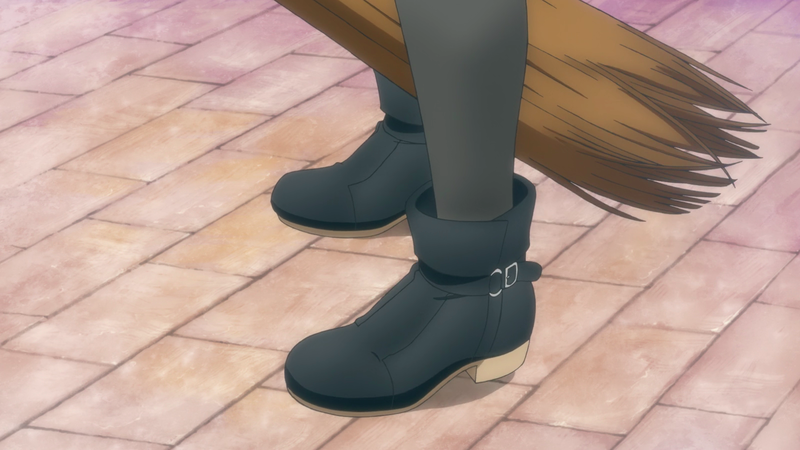 Flying Witch also builds on itself. No event is forgotten, and often previous events will be referenced throughout the series — not by the characters’ dialogue but through specific visual framing or nods. 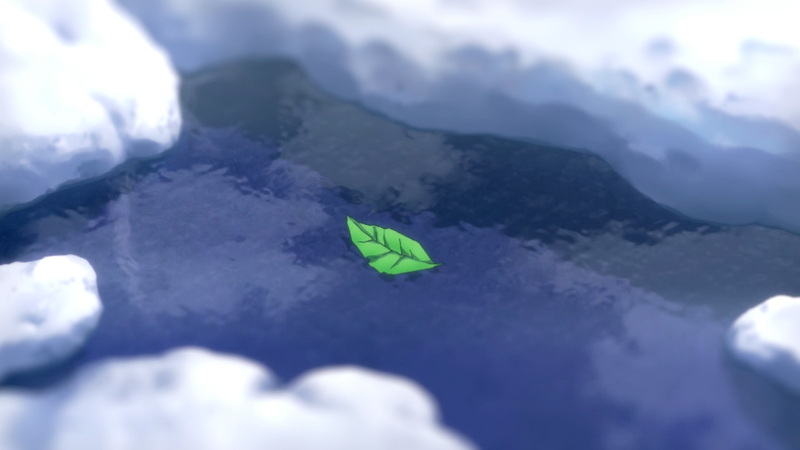 In the series’ second episode, Chinatsu is terrified by the Harbinger of Spring, a magical being. 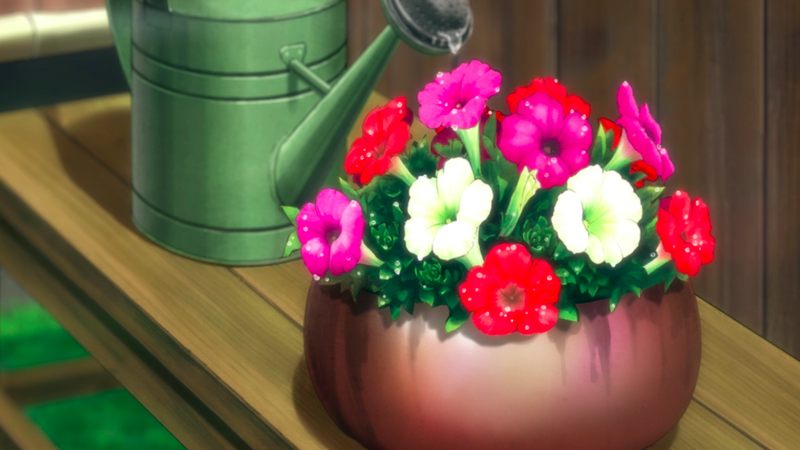 The Harbinger gives her a pot of flowers as a gift, which are then seen in later episodes including the series finale. This continuously reminds the audience that we are privy to specific character moments and growth, creating an in-series nostalgia that rewards viewers for returning week after week. Sometimes it’s enough to say that a series is good at what it wants to do and leave a recommendation at that. 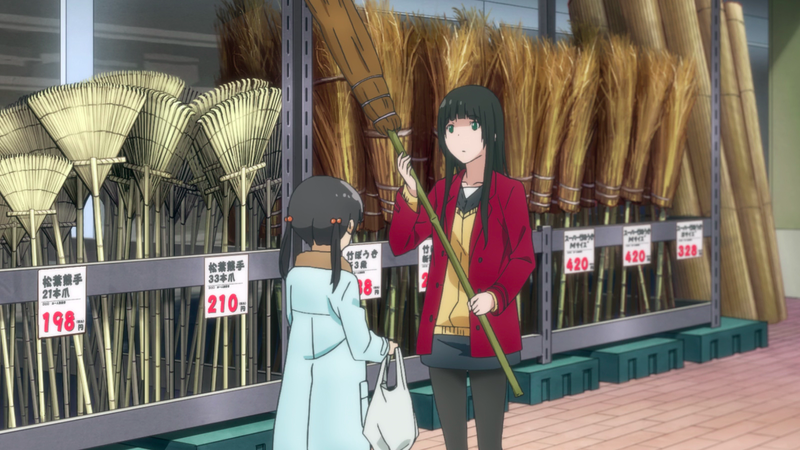 However, Flying Witch far exceeds even high expectations with surprisingly strong visual direction that perfectly juxtaposes commonplace events with witchcraft, making both magical in the viewers’ eyes. Thank you. ^ ^ I hope that more people watch this series, because it’s really special. If you already watched Flying Witch anime, how about another version?